I'm so glad that you enjoyed my flower project. Thank you so much for your kind comments! In honor of today's celebration, I decided to make the same flower, but showing you that you really don't need craft store bought materials and tools to make one. This is as simple and as eco-friendly as I could make the project. To make this flower I followed the same steps as in yesterday's tutorial. To get a bit of color in the center, I made sure that the two largest stars where cut out of cardboard that had a lot of color on the reverse side. I used the color side (face up) for those two stars and the plain cardboard side for the two smallest stars. The cardboard color is obviously not as striking as the red paper. 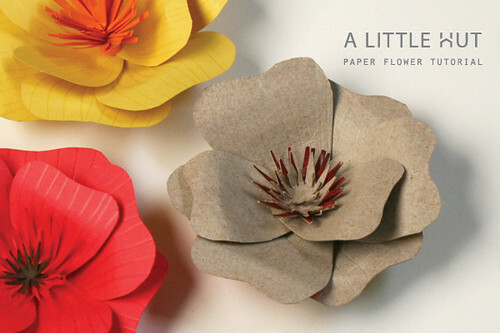 The solution is to add paint to the petals, before putting the flower together, or to make the flower out of pages of an old book or a magazine. 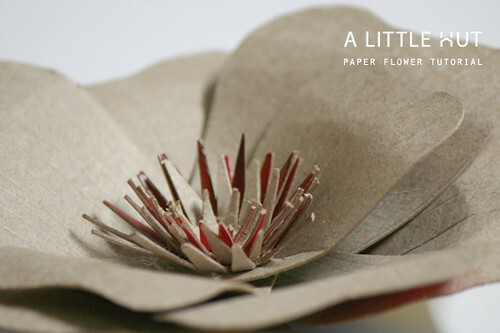 To be honest paper would probably be a better idea than the cardboard—it's flexibility makes it easier to create a graceful petal and the scoring marks are more visible.